Occasionally, I’ll dabble in drone photography. When the situation calls for it, like the most snow Seattle has seen in the past 75 years. This is the approximate view from above Schmitz Park looking out at Alki Point. In the distance, Bainbridge Island and beyond that the Olympic Mountains. Cyclists are like the postal service, they’ll ride in anything and I’m sure they were out. As I was writing this post, I saw a flash of green and yup, a bike went sliding by. To get down the hill, he hobby horsed it. That’s when you’ve got booth feet off the pedals and sliding on the ground. I don’t know how the rest of his ride turned out, but our hill he cleared. Snow Day 5, this guy goes down the hill. Indoctrination into serious road riding and racing happens by degrees, much like peeling layers from an onion. But there comes a point when cycling ceases to be an expression of the best of times. We experience the same transition in romantic relationships. At first, we date. Our most hallowed hours of the weekend are saved for the object of our affection, but soon, we can’t get enough of our heart’s desire and we begin to spend as much time as possible with them. For romantic partners, that means trips to the grocery store together and cleaning house. 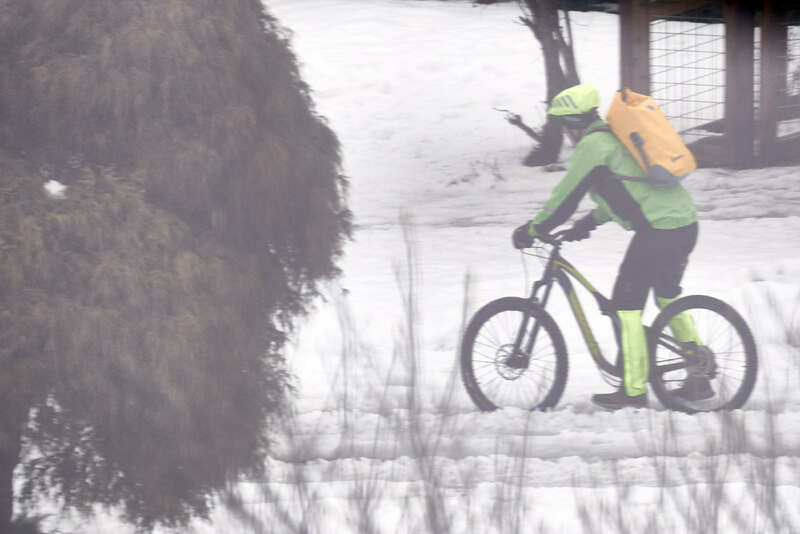 For cyclists, it means riding in the cold.